Hot springs and bathing facilities. The mythical king Bladud is supposed to have been the first to discover the healing springs of Bath. It was the Romans, however who have left us the most tangible evidence of early occupation. The Roman Baths have been fully excavated at various periods during the last century and are open to the public, together with a related museum and recent excavations on the site of the great temple of Sul Minerva. Visitors can also see the mediaeval King's Bath, the floor of which was removed in 1980 to allow access to the Roman reservoir beneath, and the Grand Pump Room where it is still possible to savour a glass of mineral water, described by Charles Dickens as possessing the ''taste of warm flat irons'', though most people these days prefer to order tea and cakes whilst listening to the strains of Couperin played to them by the Pump Room Trio. About 100 metres to the west, at the far end of the colonnaded Bath Street lies the Cross Bath, originally a mediaeval (or possibly even Roman) bath but rebuilt in the late 18th century to a design by Thomas Baldwin. The bath achieved fame in 1687 when Queen Mary, wife of James II, successfully conceived and delivered a son after ''taking the waters'' there. Opposite the Cross Bath lies the Hot Bath, largely restored to the original design of John Wood the Younger who built it in 1776 to replace the mediaeval Hot Bath which lay immediately to the west. A new Spa building has finally opened after a series of frustrating set-backs. The Hot Bath, which now connects with the new spa building, and the Cross Bath have both been redeveloped to provide public mineral water bathing and traditional spa-style therapy. A number of charitable institutions for the reception of poor visitors and cripples were established in the city from an early date. Situated close to the baths, the mediaeval hospital of St John the Baptist, founded in the 12thC, provides sheltered accommodation for elderly persons. The current buildings date largely from the 18th and 19th centuries. Ear And Eye Hospital, Walcot Terrace. This tiny specialist hospital, founded in 1823 is now a funeral parlour. The front pediment is surmounted by a bust of Hypocrites. Magdalene Hospital, Holloway. Once the site of a mediaeval leper hospital, the present building was used as an ''asylum for idiots'' until the early years of this century. Hale's Chemist, Argyle Street. Established in 1826 as a Chemist and Druggist, the business is still a going concern. The Victorian shop fittings remain largely unchanged and there is an extensive collection of ''Shop Rounds'' still in situ. Notice also the fine Coat of Arms on the exterior of the building. Royal National Hospital for Rheumatic Diseases Upper Borough Walls. Founded in 1738, this famous institution was the first national 'specialist' hospitals to be built in this country and opened in 1742 for the reception of impoverished patients whose diseases were amenable to treatment by the Bath Waters. It remains a specialist hospital but no longer offers mineral water therapy. The original building was designed by John Wood and was enlarged, firstly in 1793 by the addition of an attic storey and later in 1860 by a second building erected on the west side of the earlier edifice. Little remains of the original interior, though the basement of the Wood building has suffered the least alteration. There is a fine pediment, in Bath stone, on the 1860 building depicting the parable of the good Samaritan. 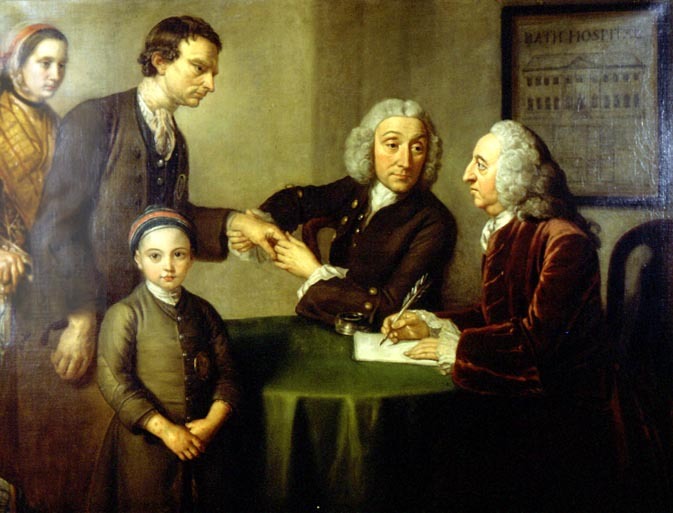 The hospital possesses a number of interesting oil paintings, in particular a picture of Dr Oliver and Mr Peirce examining three patients in 1741. The records of the hospital are incomplete, though there is a complete set of Minute Books dating from the foundation. A few early admission registers have been preserved, and there is a book containing c1500 transcriptions of 18th century referral letters often written by the patients' own doctors and containing much information of clinical and historical interest. The archival material relating to the hospital is now kept in the Bath City Archive in the Guildhall. Royal United Hospital. The original building in Beau Street was, until recently, occupied by city's Technical College. The present hospital dates from the 1930s and is sited at Combe Park. The earliest hospital at Combe Park was built to treat injured soldiers returning from the battlefields of World War I. None of the War Hospital buildings survive. Two other earlier hospitals on this site remain - the Bath and Wessex Orthopaedic Hospital (1922) and the Forbes Fraser Hospital (1924) - a small general hospital for the treatment of those of moderate means who did not wish or could not be treated at home. It takes its name from a local surgeon. The Eastern Dispensary was established in 1853 and was one of three such dispensaries in the city where medical and surgical treatment was available to those of limited means provided they had obtained a ''Ticket of Recommendation'' from a subscriber to the charity. The Eastern Dispensary was closed when the NHS was conceived and the building is currently occupied by a design agency. St Martin's Hospital, Frome Road. Built in 1834 as a work house using one of Sampson Kempthornes hexagonal plans, it has been largely redeveloped for residential use. The old psychiatric block is now used as offices for the local Primary Care Trust. Of interest is a chapel, purported to have been built single handed by one John Plass, an alcoholic patient during the early work-house era. Bath had a number of important apothecaries gardens in the 17th and 18th centuries but all trace of these have vanished. However there are several modern medicinal herb gardens here, one at Bath University (in the department of pharmacology) , another at Herschell House, 19 New King Street, and a third at the American Museum, Claverton, a small village about four miles from the city centre. The latter specialises in herbs from the New World . There is a small shop at the museum selling traditional American herbal medicines. Amongst the numerous memorials in Bath Abbey are those to several medical worthies including William Cheselden who died in Bath, supposedly after eating a Bath Bun. 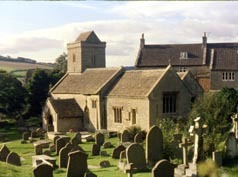 His apprentice, Samuel Sharpe is also buried here. The town's museum includes a collection of artificial limbs by Mr James Gillingham, a shoemaker who was a resident of Chard at the end of the last century.By 1903, Gillingham claimed to have treated over 7000 patients. The business was finally closed in the 1960's. Holy well. Described by Collinson in his History of Somerset as a perpetual spring containing sulphur and steel. "Against the change of weather, it smells like the foul barrel of a gun. It is very cold, leaves a white crust on the bodies it passes over and has been found efficacious in scorbutic cases." The well still reeks of sulphur though the passing traveller might mistakenly imagine that the cellophane factory at Bridgwater, not so many miles up wind of the village, had resumed production. The well was restored in 1937 in memory of Margaret Charlotte Fownes Lutterell but it is looking rather neglected. 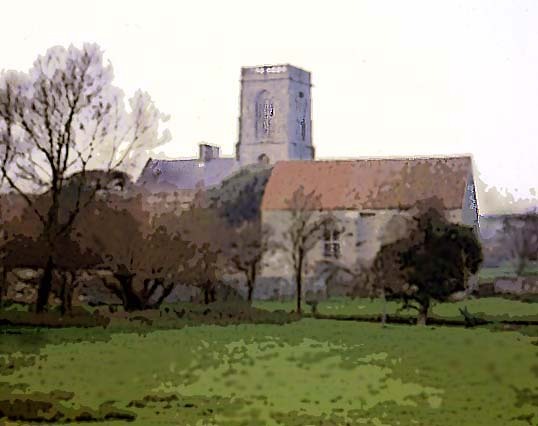 After the priory was dissolved by Henry VIII in 1536, the church suffered an unusual transformation into a dwelling house, complete with added chimney stacks built up through the nave. The tower, also dating from the fifteenth century, was left intact and has been skilfully repaired in recent years. The infirmary may have been used as a hospital for wounded soldiers during the 17th and early eighteenth century as contributions towards such an institution are mentioned in the local parish records. The last recorded payment was made in 1734. The infirmary and the church are open to the public during daylight hours. St Margaret's Leper Hospital (left) in East Reach was founded as a leper hospital in the 12th century. 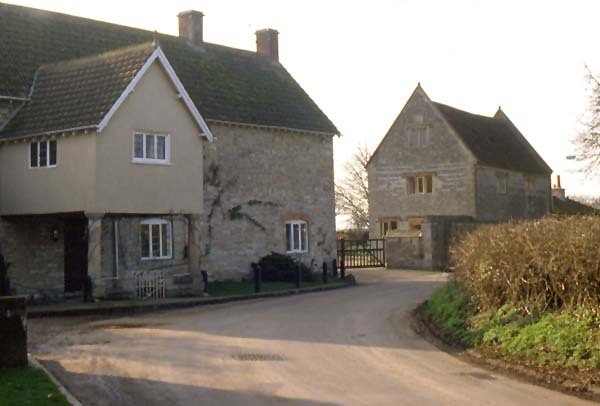 It was rebuilt in the early 16th century as almshouses, under the patronage of the Abbot Bere of Glastonbury Abbey. In 1938 the building was converted to become the headquarters of the Somerset Guild of Craftsmen and Rural Community Council. In the late 1980s the Guild moved to other accommodation and the building became derelict, after being damaged by fire. The Somerset Building Preservation Trust and the Falcon Rural Housing Association have recently repaired and converted the building into four small houses. Taunton General Hospital, South Road. "Standing on a delightful eminence, at a proper distance from the town in the midst of a large plot of garden ground...is...a large and very commodious hospital." But the building with its foundation stone, laid by Prime Minister Lord North on 29th September 1772 and inscribed "for the relief of the sick poor" was destined to become a convent. In 1780, subscriptions to the proposed hospital had fallen so short of their target that the builders, tired of waiting for their dues, abandoned the works and left the building to the mercy of vandals and the elements. As a local historian put it, the incident "blasted the hopes of the afflicted." The first general hospital at Taunton was ultimately built in 1812 in East Reach, by which time the original building had been sold for conversion into a private dwelling for one of the town's medical practitioners. " The hospital that never was" is now owned by King's College, one of the town's several Public Schools. It is not accessible to the public and can only be viewed by special permission from the school. Holy well. Small pump room with an enclosed bath was built in 1830 and Dr Beddoes of Bristol analyzed the water and proclaimed it on a par with Harrogate water. The building has long since decayed and is no more than a heap of stones, though still optimistically referred to as the Bath House. Dr John Haygarth, who moved to Bath from Chester, is buried in this country parish and there is a memorial plaque on the wall inside the church. In 1800, Haygarth performed one of the earliest comparative clinical trials to examine the placebo effect of Perkin's Tractors, a popular quack cure of the time. Cathedral Library. A former Bishop of Bath and Wells, Nicholas Bubwith, bequeathed money for building a library over the eastern walk of the cloister in 1424 where it remains today and houses a remarkably fine collection of books and incunabula , a considerable number of which are of medical and scientific interest and include a five volume set of Aristotle's Works printed in Venice in 1495-8 which formerly belonged to the famous humanist Erasmus. The library also possesses works by Avicenna (d.1037) , Ralph Bathurst (1620-1704), Robert Boyle (1627-1691) and Sir Thomas Browne (1605-1682) as well as many others. The surviving volumes of the old Bath Abbey library have been incorporated into this collection and contain a manuscript believed to have been the work of the prominent 17th century Bath physician Robert Peirce. Dr Claver Morris' House. Now part of Wells Cathedral School, this fine house in the Livery was once the home of Claver Morris (1659 - 1726) whose diary provides a fascinating glimpse of the life of a country physician working nearly three centuries ago. His elaborate memorial, commemorating fulsomely and in Latin his skills in music, chemistry and physic, and topped by a bust, can be seen in the cathedral cloisters. Another house belonging to an 18th medical family called Pulsford, can be found in New Street (now a bank). The Pulsfords' Account Book, in the Somerset Record Office at Taunton, provides an illuminating record of 18th century general practice. In 1739, quintuplets were born to a woman living in Wells. The Old Deanery Garden, 9 Cathedral Green commemorates the physician, naturalist and religious contraversialist, Dr William Turner (1508-1568) who was Dean of Wells in the 1550s and 1560s. The plants growing in the garden represent a selection of those mentioned in Turner's Herbal. The garden is open to the public on Wednesday afternoons during June, July and August. The Mendip Hospital was built in the mid 19th century to the design by Sir Gilbert Scott and served as the County Asylum. It is an imposing red brick building dominated by a central spired tower and a chapel in the style of the Gothic Revival. The buildings, including the chapel (left), have been converted into dwellings which are now known as St Cuthbert's Village. The home of Dr John Westover (1643-1706), who was a pioneer of the humane care of the mentally ill. He succeeded his father, another John, who practised here until 1678. His father's tomb in the church is inscribed "Repent, for doctor's dye'' though much of the gravestone is obscured by the font which was subsequently placed over it. The younger John Westover built the Madhouse alongside Porch House in 1680 and this still survives. Westover's Journal, an important manuscript which covers the years 1685-1700, can be viewed in the Somerset Record Office at Taunton and downloaded from the web via the Wedmore Genealogy Pages. Infirmary. In 1804, Dr Henry Sully and a surgeon colleague Mr Bishop Cranmer opened an infirmary and dispensary for the benefit of "servants, apprentices, labourers and mechanics.'' Dr Sully was sufficiently well connected to become surgeon to the Duke of Cumberland who later became King of Hanover. The Wiveliscombe Infirmary and Dispensary eventually became the premises for the local GPs until they moved into purpose built premises. Penn Villa. William Hunt first used ether as a dental anaesthetic in this house at Christmas 1847, a year after its first European use by London surgeon James Robinson. Hunt's son, also William, published the earliest English paper on the use of hypodermic injection of cocaine as a local anaesthetic in 1886. Their house is still a dental surgery more than a century and a half later.